Last week, I spent a day in an esteemed local hospital for a few tests. (I’m fine now, thanks. Go over to the National Stroke Foundation’s page on transient ischemic attacks to learn the signs in case a TIA happens to you.) While this nameless hospital may have the latest in diagnostic technology, the food services department is stuck in 1978. I received a breakfast tray with FOUR different animal products (an omelet of egg and cheese, a pint of milk, and a sausage patty); a fat, fluffy, white-flour biscuit; plain, unseasoned oatmeal, orange juice AND orange segments; nondairy creamer; Promise “heart healthy” spread, and grape jelly. WFT? Is the dietetics department trying to ensure a steady stream of returning cardiac patients? What’s wrong with wheat toast and nut butter, or a flax/bran muffin, or a fruit that’s not just a big bag of sugar? Why would any meal planner offer the same fruit and fruit juice in a meal? Who would eat mushy cooked oatmeal devoid of any seasoning at all? The entire meal was shockingly bad. Foolishly, I hoped that lunch would show improvement. Boy, was I wrong: the entire tray was a study in beige/off-white/yellow. Pictured above is breaded tilapia under a white sauce, a pile of whole-kernel corn, a white-flour roll, vanilla cookies, and unsweetened tea. I did manage to eat the salad course, a cup of cucumbers and tomatoes. I managed to break out of hospital/food prison before the dinner hour, thankfully. I high tailed it to Joe Sepie’s for shrimp & okra gumbo (see right). Ah, food with flavor, colors other than beige, and pleasant aromas. Hunger is the best seasoning, and it surely ranks as one of the best gumbos I’ve had all year. The moral of this story: bring a box of Kashi TLC bars and some salted nuts to any inpatient hospital stay, or you will leave a very hungry person. I love the addition of the “heart healthy” spread. That should fix the rest of it! Glad to hear you are home and doing ok. Looking forward to celebrating Easter with you guys! My thoughts exactly, Claire: a pat of butter would have been better than the eggs & processed cheese & sausage patty. I’d have traded the lot of it for a piece of real bread and some almond butter. What a contrast between the two pictures posted. The hospital food looks so unappetizing and industrialized; the gumbo stamy, robust and inviting. Glad you are OK and looking forward to future posts. I know hospital food seems weird to someone who is in the know about nutrition or who happens to be a decent cook, but there is a simple explanation. People won’t eat what they should eat, and since it’s a short-term diet, they try to put on a plate what people are familiar with, will actually eat or pick at a bit, following guidlines for only salt or sugar. I’ve been in the medical field for over 50 years, and trying to get someone to eat in those circumstances is a priority. 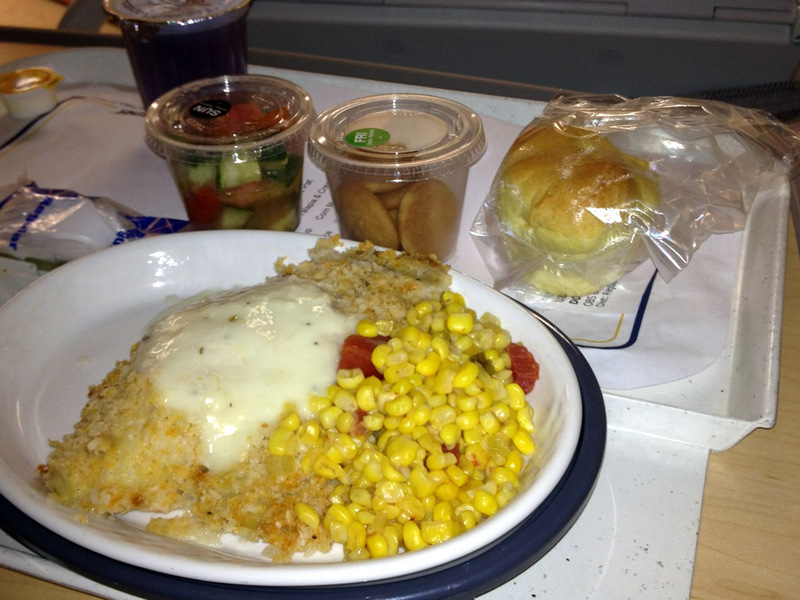 Only time I was in the hospital and was served what I should have been served, fairly decently cooked, was when I was in for suspicious heart problems and they actually served a specially prepared diet for their patients, along with daily classes in how to fix it at home. But, that was about 30 years ago, very expensive hospital, and they quit doing it long ago. I dunno–I didn’t see much evidence of familiarity or plain cooking. What I saw was evidence of cost-cutting, mass production, and commissary foods. The oranges were cut into supremes and sealed inside a cup; ditto for the “tea”. Plain beans and rice would have been acceptable to most anyone in that hospital over a stinky piece of tilapia covered in starch under a starchy sauce. I think it’s more about outsourcing food production to Sysco et al, rather than having real live human cooks making food from scratch. LMAO over the “repeat customer” idea but I’m darn glad that you are ok. TIA is not a stroke but it ain’t no joke! Take care, Celeste.